A George I Burl Walnut Bureau Bookcase - Print View - Hyde Park Antiques, Ltd. 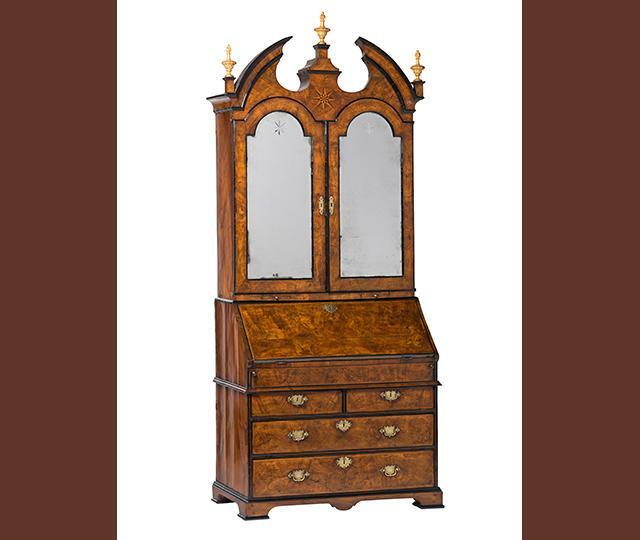 Height: 97 1/2" Width: 39 1/2" Depth: 23"
The upper part having a swan’s neck pediment centered by an inlaid star medallion and surmounted by gilt finials, over a pair of mirror-fronted doors opening to a fully fitted interior of small drawers, folio slides, pigeon holes and secret compartments hidden in the pilasters flanking the central prospect door, all set above two candle slides; the slant front opening to a leather-lined writing surface with conforming interior; the case executed in vibrant walnut with ebony molding throughout. A similar bookcase is illustrated in P. MacQuoid and R. Edwards, The Dictionary of English Furniture, vol. I, rev. edn., 1954, p 139, fig. 37.